Saturday morning Plein Air, this is just the blocking in stage. Once again, the neighborhood was singing it's song. "Lawn mowers and Weed Whackers". I had a problem with the acrylic paint drying to fast. I was to lazy to take the time and use my acrylic pallet, and yes at one point my painting was airborne. All in all it was delightful. Thank God for digital cameras. I can finish this one in my studio. 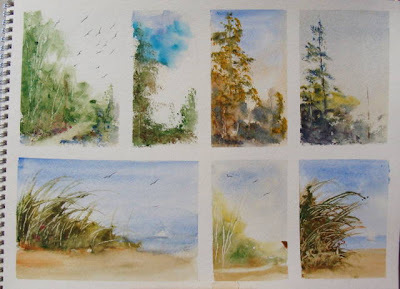 Tuesday was a plein air day for me. 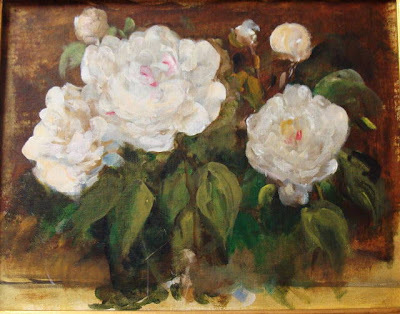 I used my Traveling Monet easel and painted these peonie don't know the correct spelling. Loved every minute of being outdoors. I know that more tones are needed. Posting what I painted is in a way keeping a journal. 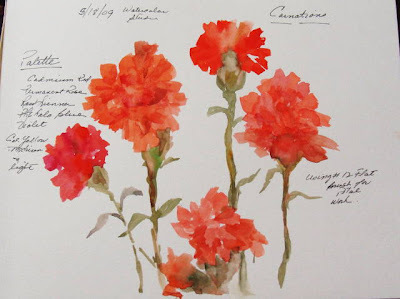 Carnations in watercolor. These studies were all I could do this week. Where does the time go. I promised myself I would stay away from the computer to paint. Well I guess the computer isn't the only way I procrastinate. Maybe next week, I will do more. I received my Guerrila paintbox and now I am all set to go out there and paint plein air. 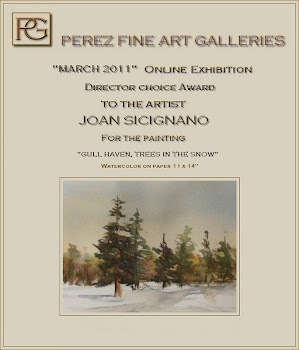 This weekend is the SBAA membership show. Went to the reception last night. Very talented artist displayed their work. A little disappointed that I didn't receive an award, but I am very happy for those artist that did get the recognition they deserve. Today I have the grandchildren coming over for an overnight visit, great joy and fun. So I wish everyone out there a very enjoyable Memorial Day weekend. Some of the floral studies I did this week. 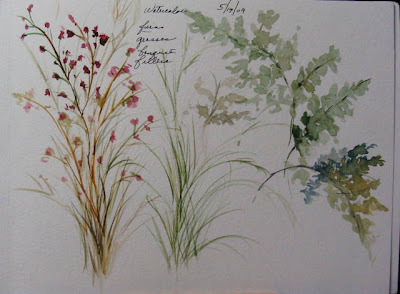 Watercolor studies of different foliage. Happy Friday everyone. Today I went back to painting in oils. I've been using the Golden Open acrylics for most of my work. I started in acrylic background, once again influenced by Gary Jenkins. It's a fun technique. 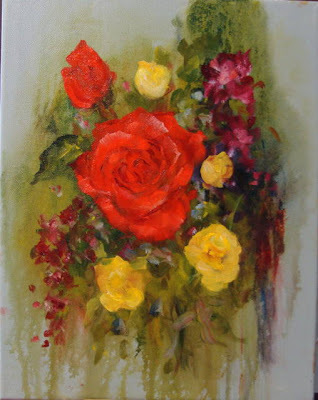 Then painted the flowers in oil. I will try to finish this tomorrow, it needs more tones. 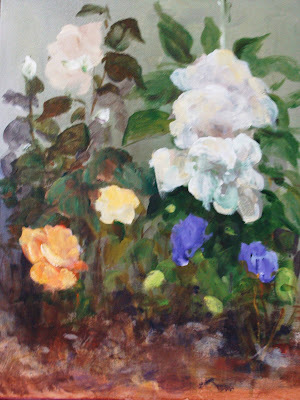 I neglected to mention, the floral painting, is done from my own still life set-up. But the painting was influenced by Gary Jenkins, he has been on my PBS station. I have to say how talented he and his wife are. Happy rainy Thursday everyone. After going through a painters block all week. 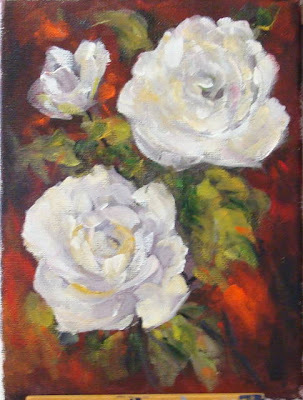 I should have done my morning pages but I didn't Anyway my first attempt of white roses. 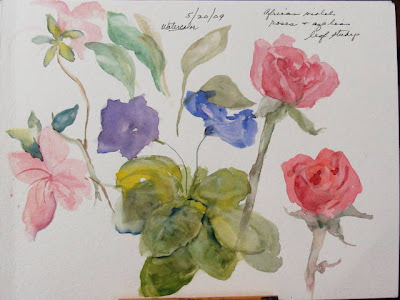 Thank you Nancy Medina for recommending Robert A. Johnson's dvd on floral painting. I am looking forward to its arrival. In the meantime, I started studying once again. Trying to eliminate the frame. Just found out, frames should not be included when displaying on the web. Oh, so much to learn. Next, is to take better pictures so cropping will be better. Happy Monday everyone!